Step1: Enter your card details to proceed with the transaction. 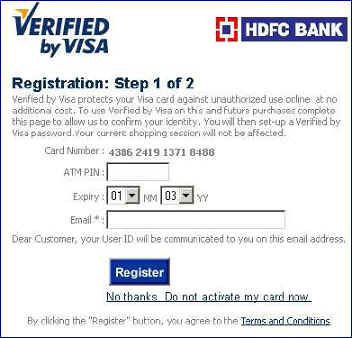 Step2: You will now be required to register for Verified by Visa or Master Card Secure code. Once the registration is complete you can proceed with the transaction by entering your secret password . To skip registration you need to click on "No thanks. Do not activate my card now"